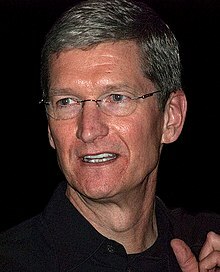 Timothy Donald "Tim" Cook (born November 1, 1960) is the chief executive officer of Apple Inc.. He joined the company in March 1998. On August 24, 2011, he was made the CEO of Apple after the resignation of Steve Jobs, who died on October 5, 2011 from pancreatic cancer. Cook grew up in Robertsdale, Alabama, near Mobile. His father was a shipyard worker, and his mother was a homemaker. Cook finished high school at Robertsdale High School, earned a B.S. degree in industrial engineering from Auburn University in 1982, and his M.B.A. from Duke University's Fuqua School of Business in 1988. Cook came out as gay on October 30, 2014 making him the first openly gay CEO on the Fortune Top 500. Cook spent six months at Compaq as the Vice President for Corporate Materials before he was hired by Steve Jobs to join Apple. At first, he was the Senior Vice President for Worldwide Operations. Before that, Cook was the chief operating officer (COO) of the computer reseller division of Intelligent Electronics and spent 12 years in IBM's personal computer business as the director of North American Fulfillment. Cook is praised for pulling Apple out of working by closing factories and warehouses around the world. This helped the company get lower inventory levels and make its supply chain easy, making margins a lot bigger. In January 2007, Cook was promoted to COO. Cook served as Apple CEO for two months in 2004, when Jobs was healing from pancreatic cancer surgery. In 2009, Cook was made Apple CEO again for several months while Jobs had to leave for a liver transplant. In January 2011, Apple's Board of Directors allowed Jobs to leave again for medical reasons. During that time, Cook was responsible for most of Apple’s day-to-day operations while Jobs made most big decisions. After Jobs retired, Cook was made permanent CEO of Apple on August 24, 2011. Cook is also on the board of directors of Nike. ↑ "Steve Jobs Resigns as CEO of Apple". Apple Inc. August 24, 2011. Retrieved August 25, 2011. ↑ 2.0 2.1 2.2 "Timothy D. Cook Profile - Forbes.com". Forbes. ↑ Wright, Sharla (October 25, 2005). "Engineering Alumnus Named COO of Apple". Auburn University. Retrieved July 26, 2007. ↑ Love, Julia (January 14, 2009). "Fuqua grad takes reins at Apple". The Chronicle (Duke University). Retrieved February 11, 2011. ↑ Lashinsky, Adam (November 10, 2008). "The genius behind Steve". CNN. Retrieved May 25, 2010. ↑ Helft, Miguel (January 23, 2011). "The Understudy Takes the Stage at Apple". The New York Times. Retrieved February 11, 2011. ↑ "Apple boss Steve Jobs takes 'medical leave'". BBC. January 17, 2011. Retrieved February 11, 2011. ↑ "Steve Jobs resigns from Apple, Cook becomes CEO". Reuters. August 24, 2011. Retrieved August 24, 2011. ↑ Wingfield, Nick (October 16, 2006). "Apple's no. 2 has low profile, high impact". The Wall Street Journal. Retrieved October 16, 2006. ↑ Board of Directors, Nike. This page was last changed on 14 January 2019, at 18:18.